Enquire now for a quotation on our tailor made Singapore Grand Prix and Paddock Club ticket and hospitality packages. For one week in September, every year since 2008, the Marina Bay has become home to the Singapore Grand Prix. Racing fans flock to the picturesque harbourside location to witness the world’s best drivers dart around the Marina Bay Street Circuit. Singapore was actually the host of a non-championship race – Formula Libra – way back in 1961, but the event was cancelled in 1973 due to general inconvenience and after the track was deemed dangerous and unsuitable. As well as the return of racing, 2008 was the year that Singapore became the first Grand Prix location to hold a night-time event. 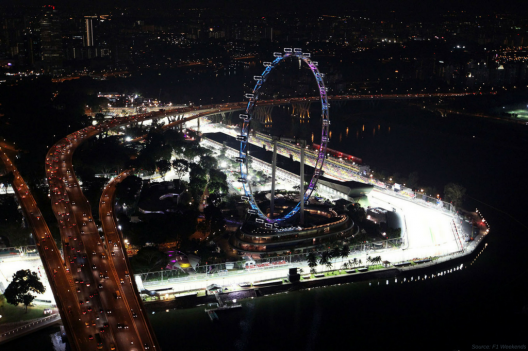 As darkness falls the Marina Bay Street Circuit is illuminated by powerful floodlights – a stunning scene against a backdrop of the country’s twinkling capital city. On their dash around the track, drivers pass by a number of Singapore’s iconic landmarks – including the Singapore Flyer (the largest observation wheel in Asia), Merlion Park and the Float at Marina Bay (the world’s biggest floating stage). The circuit has been subject to some changes since its 2008 revival, but drivers have acknowledged a number of features that make it trickier than others in certain areas. 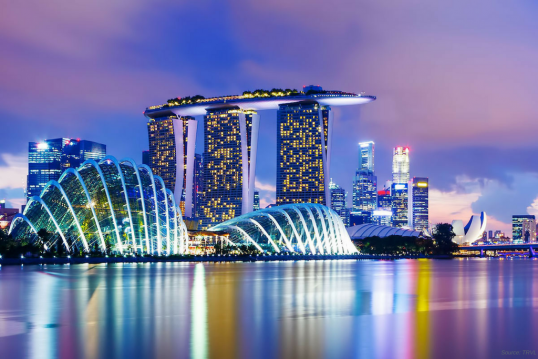 Singapore endures hot and humid heat in the summertime, and their energy can drain under the intense sun. The circuit’s bumpy surface and sharp corners also make it difficult to navigate. The night race is accompanied by an array of parties and other escapades – you won’t find yourself bored in this charming city during Grand Prix season. Premium lounges and bars across the city screen the race. Many venues also host events like fashion shows and international DJs. The atmosphere in Singapore around this time of year resembles carnival spirit, with art installations popping up across the city and street performers in central areas. Formula One celebrate their official events at the Circuit Park – previous performers include big names like Katy Perry and Jennifer Lopez. If you’re looking for a calmer place to unwind, head to the beautiful Gardens By The Bay. This enormous nature park includes a 3km waterfront promenade, Cloud Forest (a conservatory that replicates the moist conditions of tropical mountain regions) and Supertree Grove (vertical gardens that dominate the park, complete with an elevated walkway to give visitors an amazing aerial view), and more. There’s so much to see and do during Grand Prix season in Singapore, and we want you to experience as much of it as possible! This is where the BAC Sport Singapore Grand Prix hospitality packages come in – we can organise your entire trip, from luxury accommodation to entertainment, and, of course, supply you with tickets to one of the hottest Formula One events of the year. We’ll take care of everything, so you and your guests can experience the beauty and excitement of the Singapore Grand Prix without having to worry about a thing! 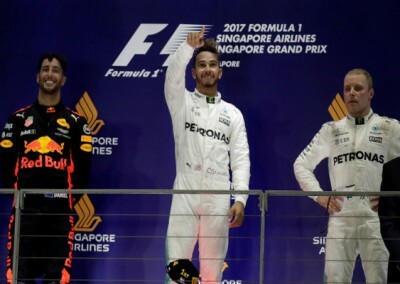 As one of the biggest racing events of the year it’s unsurprising that tickets for the Singapore Grand Prix 2018 are in high demand. As part of our Singapore Grand Prix hospitality packages we can provide tickets at every level for practice, qualifying and the Grand Prix itself. This means that avid Formula One buffs have the opportunity to catch every second of the event, while the more casual fans can just opt to attend the final races. 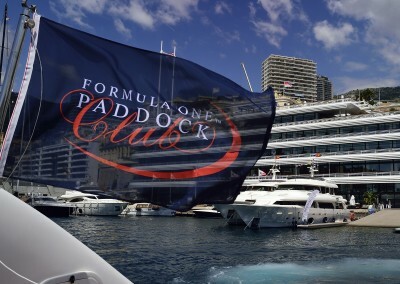 As an official distributor, we can also provide tickets for the exclusive Formula One Paddock Club, where you’ll get to rub shoulders with racing celebrities and enjoy the most incredible Grand Prix hospitality on offer. Whether you’re a Singapore Grand Prix newbie and we’ve sparked your interest, or you’re already planning on attending the event, have a look at our Singapore Grand Prix packages and Paddock Club hospitality options below for more info on hospitality, entertainment and tickets. You can also get in touch with us via the Request A Callback form, or call the BAC Sport offices directly to chat with one of our experienced team members to plan your Singapore Grand Prix experience.